The Nigerian Police (NP) is the principal law enforcement agency in Nigeria and its functions, duties and powers are contained and regulated by the Police Act (CAP P19 Laws of the Federation of Nigeria 2004). Additionally, Police Officers are subject to the code of conduct for Police Officers. The Criminal Investigation Department is the highest criminal investigative arm of the Nigerian Police Force. 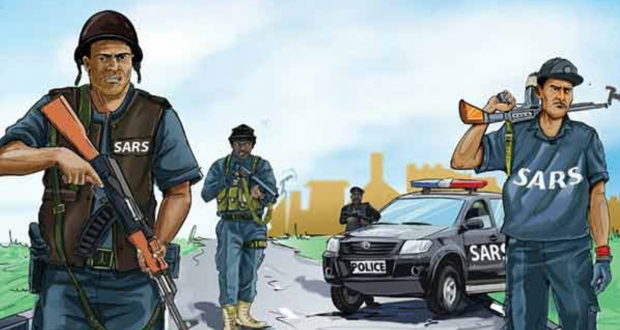 The Special Anti-Robbery Squad (commonly known as SARS) is one of the 15 units under the Nigerian Police Criminal Investigation and Intelligence Department. Its duties include the arrest, investigation and prosecution of suspected armed robbers, murderers and others involved in the commission of violent crimes. The NP are an organization recognized as the custodians of security and order in society. However, in light of current events, the SARS unit of the NP is being touted as a violent, exploitative and oppressive system by disgruntled citizens. This article shall consider the negative reputation of the SARS and highlight the rule of law in relation to the powers of the NP. The writer will present a very familiar scenario which most Nigerians have experienced firsthand, witnessed or been told about. A lot of people will affirm that this story is a familiar one. A young man on vacation to Nigeria is arrested while taking a leisurely stroll in the evening. He is confused as to the reason he has been arrested but strongly believes an explanation will be given; after all everyone is allowed to take strolls, right? He is subsequently whisked off to an unknown police station, and after 48 hours in detention with no communication with his family; his belief that he cannot be arrested for no reason at all has faltered greatly. He has of course been stripped of all his personal effects; his fancy phone inclusive. By the time a kind person manages to contact his mother on his behalf; his belief has taken a complete turn around and now he is certain that there is no escape from the hell hole he exists in. This is not a place where shouting, crying or begging achieves any results. His mother’s joy that her only son has been found and was not kidnapped as she previously feared is cut short; perhaps his fate may have been better at the hands of kidnappers who merely wanted a satisfying ransom. This young man was right after all; because he was killed in custody with the explanation that he was a robbery suspect who tried to escape. Many of such people are not alive to tell their story. They have been silenced forever; the horrors they faced not to be discovered by anyone. Nigerians in their myriad of challenges forget the past, until the present reality resurfaces buried memories. Sequel to various continuous reported and unreported incidents of abuse, harassment, unlawful detention, extortion and murder by officials of the Special Anti-Robbery Squad; Nigerians are now advocating vigorously for the elimination of SARS on social media and the campaign against SARS is trending. 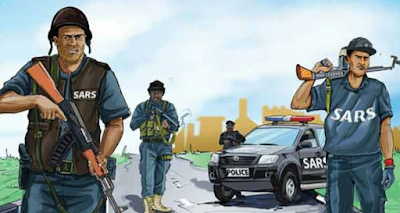 A series of reports have been made in the past few years with respect to the degrading treatment and unjust harassment frequently meted out by SARS operative; a notable report is the one made by Amnesty International in 2016 (https://www.amnesty.org/en/latest/news/2016/09/nigeria-special-police-squad-get-rich-torturing-detainees/) wherein a press release accusing SARS officials of extortion, torture and inhumane treatment was vehemently refuted by the Inspector General of the Nigerian Police Force. Irrespective of the admittance or refusal of the allegations levied against officials of SARS, it is no news that the motto of the NP; “Police is your friend” is very laughable in Nigeria. Millions of people have been harassed and oppressed and continue to be subject to dehumanizing and degrading treatment by police men while supposedly carrying out their duties. It would appear that most people while not being completely ignorant of their rights simply do not know what to do, and the few that are informed would understandably cower in fear or have lost the will to fight for a seemingly hopeless cause. The need to reiterate our basic rights cannot be over emphasized as we continue to lend our voices as a sword till we get the desired result. The various forms of infringement of our fundamental human rights in the exercise of the powers of officials of the SARS will now be considered in tandem with the existing legal frame work that should regulate the conduct of Police Officers. It is relevant to note as a preamble that Article 5 of the Universal Declaration of Human Rights and Article 7 of the International Covenant on Civil and Political Rights provide that no one shall be subjected to torture or to cruel, inhuman or degrading treatment or punishment. Nigeria as a country should aim to achieve internationally recognized standards of human rights, not only by the mere ratification of international treaties and conventions but in the practical demonstration that as a nation, we uphold the sanctity of life and we view human rights as paramount. Arrest without warrant: Section 24 of the Police Act provides that a Police Officer can lawfully arrest without warrant for a felony, a misdemeanor, a simple offence or for breach of peace. It would therefore appear that a Police Officer can arrest without warrant at all times; as the definition of what qualifies as reasonable suspicion remains non-specific and non-delineated. However; Section 3(1) of the Administration of Criminal Justice Law 2011 (ACJL) provides that the Police Officer must inform the person arrested of the cause of the arrest. Similarly, Section 4 of the Police Act prohibits arresting a person in lieu of a suspect; which implies that one person cannot be arrested in place of another. Additionally, Section 3 (2) & (3) states that the person must also be informed of his right to remain silent, the right to consult his lawyer before making any statement and the right to free legal representation. Furthermore, by the provisions of Section 35 (5) of the 1999 constitution a person who is arrested without warrant must not be detained for more than 24 hours where there is a Court of competent jurisdiction within a radius of 40kilometres or in any other case, 48 hours or for such longer period that the Court may consider to be reasonable. A deviation from the provisions of the law on arrest entitles the victim to seek enforcement of his fundamental rights, damages and a public apology. Torture and inhumane treatment: Nigeria has ratified the International Convention on Civil and Political Rights (ICCPR) in 1993, the Convention against Torture (CAT) in 2001 and the Optional Protocol to the Convention against Torture (OPCAT) in 2009. Additionally, Nigeria is a member of the African Charter on Human and People’s rights. Irrespective of the above, the practice of torture and ill treatment by Police Officers in general and officials of SARS particularly remains rampant. There are countless experiences of people who have been brutalized, ill-treated and tortured in detention. Section 34 (1) of the 1999 Constitution of the Federal Republic of Nigeria (as amended) prohibits the use of torture and inhuman or degrading treatment, therefore a person under detention who is beaten or threatened has the right to seek legal redress for infringement of his right. Unlawful detention: The right to personal liberty is guaranteed under Section 35 of the 1999 Constitution. Even though this right is not absolute; any restraint to personal liberty must be done in accordance with a procedure permitted by law. Unlawful detention can be defined as keeping a person in custody without any lawful reason. (https://dictionary.thelaw.com). Therefore, being detained in the custody of the Nigerian Police either with or without the power to arrest and detain may amount to unlawful detention. It could also be interpreted to mean being held up at a gun point with threat of being shot if you try to move. In the same vein, a proviso to section 35 (1) of the constitution (as amended) states that ,“a person who is charged with an offence who has been detained in unlawful custody awaiting trial shall not continue to be kept in such detention for a period longer than the maximum period of imprisonment prescribed for the offence”. A contravention of the laws guiding the right to personal liberty will therefore amount to a breach of fundamental rights. Inducement to give false confession: A false confession is an admission of guilt for a crime for which the confessor is not responsible. (en.m.wikipedia.org/wiki/false_confession). The right to dignity of human person as contained in Section 34 of the Constitution which prohibits torture extends to the right not to be forced by the police to make a statement under duress. Therefore, a statement must be given voluntarily by the person making the statement without physical coercion, torture, promise or threats. Any such confession can be set aside in a Court of competent jurisdiction. Extra Judicial killing: An extrajudicial killing (also known as extrajudicial execution) is the murder of a person by governmental authorities without the sanction of any judicial proceeding or legal process. (https://en.wikipedia.org/wiki/Extrajudicial_killing). The relevant provision of the Constitution with respect to the right to life is Section 33 (1) which provides that a person can only be deprived of his right to life when he has been found guilty of a criminal offence. A person can also be deprived of his right to life in order to effect a lawful arrest or to prevent the escape of a person lawfully detained. Therefore; a person who has been unlawfully detained and is killed in custody has been illegally deprived of the right to life. Section 36 of the Constitution provides for the right to fair hearing and Section 36(5) provides that an accused person is deemed innocent until proven guilty in a competent court of law. Therefore, it grossly offends the intent of the NP as custodians of the security of the citizenry to kill an armed robber or any other person in custody. The relatives of a victim of extra judicial killing have a right of recourse against both the police officers responsible for the death and the Nigerian Police as an organization. It is clear that the provisions of the Constitution with respect to human rights are grossly violated by the NP who continually infringe on rights guaranteed under Sections 33, 34, 35, 36 and 41 of the Constitution. Furthermore, the power of the police to arrest and detain is indisputably wide and has created the forum for abusive interpretation by officials of SARS, the entire police force and other law enforcement agencies. The elimination of the Special Anti-Robbery Squad may not be the absolute solution as that may lead to a change in uniform and not character .There is however an urgent need to contain the abuse of power and excesses of government agencies and their personnel/officers; inclusive but not limited to the NP in the performance of their duties. Furthermore, it is pertinent that checks and balances are created as well as the implementation of proper training of Police Officers in areas such as safety, use of firearms, respect for human rights, treatment of suspects and other related areas. This may involve the dismissal of unqualified, erratic or emotionally unstable police officers from the NP. Additionally, there is a need to introduce a system that involves inventory and records of detainees, investigation of all incidents of torture and extra judicial killings, supervision of all police officers and sanction. Section 36 (6) of the Constitution provides that a person who is unlawfully detained shall be entitled to compensation and public apology. See the case of Ozide &Ors. Vs Ewuzie &Ors. (2015) LPELR - 24482 CA where it was held that damages in compensation, legally and naturally follow every act of violation of a citizen's fundamental right. Nigerians are therefore encouraged to challenge the breach of their constitutional rights by the Police or any other law enforcement agencies in a bid to curb extreme and unrestrained violation of rights. Accountability plays a major role. If we do not begin to learn to take responsibility for our actions, from the petty thief to the dubious employee, the corrupt politician or the trigger happy police man; then the change we are all advocating for will remain chants of a frustrated people.